For centuries, sifters -- also known as sieves -- have been used to separate parts of a mixture containing many elements, such as small deposits of gold mixed with sediment. In its most basic form, a sifter is a vessel with a mesh bottom. 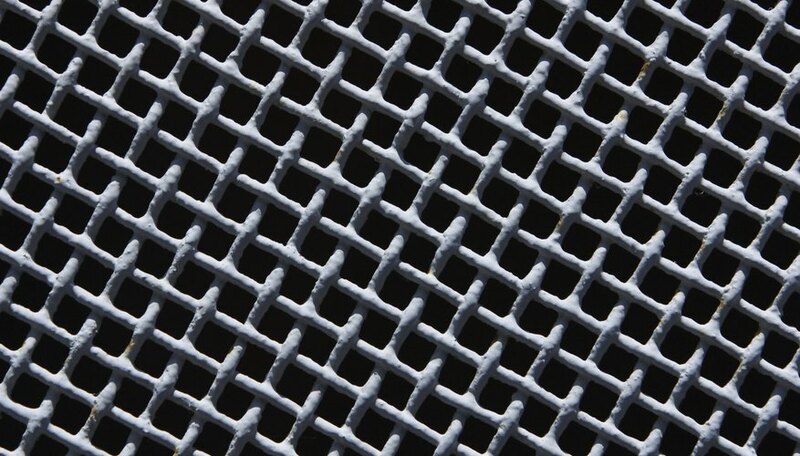 When shaken or vibrated, certain elements of the mixture within the sifter are passed through the mesh, while others remain on top. Since manually doing this can be inefficient and exhausting, most modern sifters vibrate themselves. A basic vibrating sifter can be made using common materials, an electric motor and a few power tools. Cut one of the wood boards in half with a table saw; cut another into two 2-foot boards. Attach the boards together with an electric drill and screws so they form a rectangle and the 2-foot boards are held between the 4-foot boards. This will become the base for the entire machine. Cut another wood board in half, and attach the pieces to the middle of the outside of each 4-foot board from Step 1 using a drill and screws. Position them so that they are upright and perpendicular to the base. Set the base aside, and repeat Step 1 to create another rectangle formed from 4-foot and 2-foot boards. This time, however, use the 4-foot section remaining from Step 1, and cut another board that is 8 feet long, 4 inches wide and 2 inches thick into one 4-foot section and two 2-foot sections. This will ensure that there is no wood left over. Attach the mesh to the top of the frame from Step 3 by screwing the outsides of the mesh to the wood boards of the frame. Make sure that there are enough screws to hold the mesh firmly in place. Attach the completed frame to the base at an angle with an electric drill and screws, so that the middles of the 4-foot boards on the frame are screwed to the base halfway up the 4-foot upright boards. One of the 2-foot sides of the frame should be screwed to one of the 2-foot sides of the base. The frame should now be firmly attached to the base at an angle. Cut a piece 4 feet 2 inches long from the remaining 8-foot-long, 4-inch-wide and 2-inch-thick board. Use an electric drill and screws to attach this piece directly to the base on top of the two upright boards. Position it so that it sits directly over the wire mesh. Use a hacksaw to cut a 1/16-by-1/4-inch aluminum bar down to a length of 3 inches. Drill a hole toward one side of the bar using an electric drill with a 1/8-inch drill bit. Remove the blade from the jigsaw, and put the aluminum bar in its place with the hole facing down. Secure the jigsaw to the board from Step 6 by screwing its base onto the board with an electric drill and screws. Make sure that the jigsaw is firmly attached to the board. Cut a 1-by-1-inch hardwood dowel down to a length of 2 feet with a table saw, and screw in a large screw-eye hook on each side. Screw in two more in the middle of the dowel so that they are opposite of each other, and secure a bungee cord between each hook and the base. Insert the top portion of an S-hook through the hole, and attach a 6-inch length of chain through the bottom half. Attach the top half on an S-hook to the bottom of the chain, then attach two 2-foot lengths of chain to the bottom half. Attach these to the chains to the two hooks on either end of the 2-foot dowel from Step 9 so that they are taut. Vladimir Rusakov works in the Web content industry, writing and marketing content for various individuals, businesses and online content firms. He is currently pursuing a degree in entrepreneurship. Rusakov has worked as a technical writer, covering various subjects pertaining to mechanical engineering and manufacturing.